Pamela Levine, Youth in Arts’ Executive Director from 1996 to 2006, passed away in April 2007 after a lengthy battle with cancer. Her passion and dedication to Youth in Arts and to our mission of arts education will always be remembered. With a generous donation in Pam’s memory from the Laszlo N. Tauber Family Foundation, Youth in Arts established The Pamela Levine Arts Education Fund. The Fund serves as seed funds for an endowment for Youth in Arts. Tax-deductible donations can be made to the Fund by making a note on your check or online donation that you wish to donate to this special cause. Each year, Youth in Arts honors one or more individuals, or an organization, for exceptional work in providing or supporting arts education in Marin. Important criteria include effective collaboration and success in building links between programs and the community. Awardees are selected by the Staff and Board of Youth in Arts in collaboration with the family of Pam Levine. The $1,000 award is presented at a Youth in Arts community event. 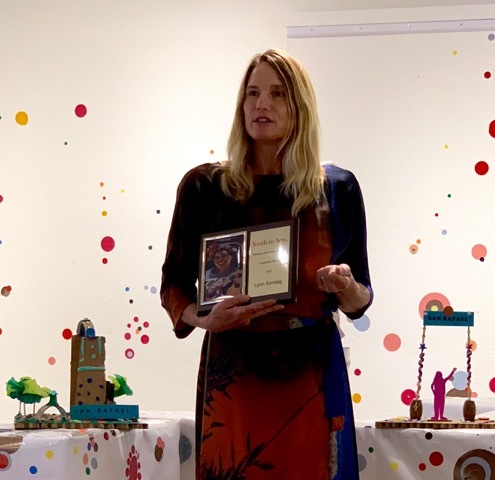 Executive Director Miko Lee presented the $1,000 award to Dr. Lynn Sondag at YIA Gallery on Friday, October 12 as part of the launch of the Downtown San Rafael Arts District. Lynn is a visual artist who focuses on realistic landscapes. She had has exhibits of her work in many galleries including the Triton Museum, Triangle Gallery, the San Francisco Public Library as well as in Germany and India. Lynn is also the rotating Chair of the Dominican University Art Department where she has been developing a Masters program in Public Art. Lynn is deeply committed to arts education at every level. She created the collaborative murals between homeless members of the Downtown StreetTeam and Dominican Students, which were on display as part of YIA’s Creative San Rafael. She also began an ongoing art program for kids in the Canal taught by her Dominican students. As a current board member of ArtWorks Downtown she has served as the lead of the San Rafael Arts District planning process. She has been an active member in the Marin Arts Education and the County arts planning processes. 2017: Mike Roche, Owner of RileyStreet Art Supply, for supporting families displaced by the North Bay fires and consistently partnering with artists and arts organizations. 2016: Jane Kramer, founder and Executive Director of Enriching Lives Through Music (ELM) for bringing music to young people in the Canal. 2015: Susan Andrews, for founding and leading Oak Hill School and making sure all students on the autism spectrum receive arts education programs. 2014: Cassandra Flipper, for leading Bread & Roses, and providing performing arts experiences for thousands of children. 2013: Julia James, Teaching Artist, for her wonderful visual arts work with students and celebrating their work through Gallery exhibits. 2012: Carol Cooper, for building a model arts program as Head of School at Willow Creek Academy, and for working at the county level to build arts education resources. 2011: Betty Lituanio, for working to ensure children of all abilities have opportunities to participate in the arts. 2010: Joan Capurro, Vice President, Bank of Marin for business leadership in the arts. 2009: Joy Phoenix and Ingrid Purcell, for their long time volunteer service on the board of Youth in Arts, respectively running the Photography Team and creating the Volunteer Program for the Italian Street Painting Festival. 2008: Marty Meade, Teaching Artist, for her exemplary work with students of all ages and abilities, including highly at-risk youth. Pam lived a full and rewarding life in her 52 years. She was born in Brooklyn, grew up in New York and moved to the Bay Area in 1977 to complete doctoral work in Psychology. She married Dr. Stephen Levine in 1982 and was deeply proud of her children Jacob and Sasha. Before coming to Youth in Arts, Pam was President of RVSC (now the Yes Foundation) and served on the Ross Valley District School Board. At Youth in Arts, Pam oversaw the expansion of the organization and received extensive accolades for her work. Pam’s soul was sweet, artistic and overflowing with love. 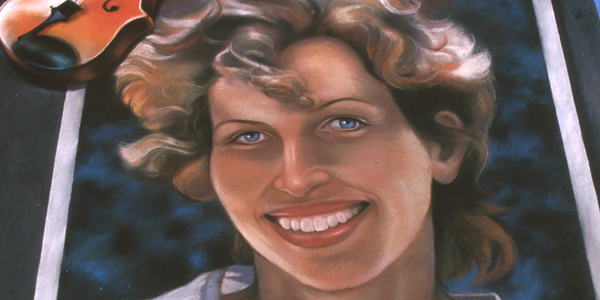 A sculptor and dancer in her youth, she was dedicated to enriching the Marin community through the arts and arts education. Pam, a non-smoker, would have liked to give thanks to all who showed their love and support during her three-and-a-half year battle with lung cancer.